Stamco’s new coil line, which requires only 17.5 ft. of floor space, feeds a 3000-ton Verson press with HSLA steel to 3⁄8 in. thick and 36 in. wide. labor providing customers in the automotive and heavy-truck market, in addition to others, with heavy-gauge stampings as well as a host of value-added services such as welding, machining, parts washing and assembly. In 1997 the company expanded its stamping capacity, to handle plate as thick as ¾ in., by installing a 3000-ton Verson press for transfer-die applications. To run progressive dies on the massive press, with high-strength low-alloy (HSLA) steels with yield strength to 50,000 psi, the firm added a feed unit to the press with straightener and coil cradle rated for material to 48 in. wide. For a few years, production on the press line ran smoothly, stamping housing covers, backing plates and other parts for the heavy trucking industry. Materials ranged from 1⁄4 to 3⁄8 in. thick, and in many cases the stampings weighed as much as 20 lb. At the time, the feed system was considered heavy duty, more than capable of running the types of jobs required. But after some time, customers increasingly began specifying their parts be made of HSLA materials with 80,000-psi yield strength, which, according to Howard (Skip) Nieberding, Stamco’s special projects/safety manager, was approximately equivalent to stamping materials at double the thickness. Also, a Stamco customer of brake components for Class A trucks requested that more of the parts run on the transfer press so that secondary piercing and forming operations could be performed under the single ram, rather than running the parts on a series of single-hit dies. It reduced the variety of part designs and restricted the quantity of part numbers, allowing Stamco to run larger volumes and justify moving the job to the transfer press. The move saved the customer money, but further strained the feed line. “That’s when things started to not run so smoothly,” says Nieberding. “Our existing feed system, with pneumatic pinch rolls and a 40-hp drive, struggled to pull the 80,000-psi material. We experienced excessive wear and tear on the equipment, side guides were destroyed and the system could not dekink the trailing edge of the coiled material. This resulted in downtime with each coil of steel, as operators cut the end off with nibblers, a slow and hazardous operation. In 2006, Nieberding took on the challenge of finding a new feed and straightener system for the massive Verson press that could tackle the heavy-duty work load and deliver feed performance, straightening quality and simple serviceability. He began his search with a list of 11 press-feed suppliers he thought would be capable of satisfying Stamco’s specifications. Stamco’s new Dallas coil line features a hydraulically operated de-kinking mechanism to remove the trailing-end wrap bend of the coil ID, allowing Stamco to optimize material use. It also eliminates the need to manually cut the ends, and the associated risks. A coil stop, peeler and threading-assist assembly also are incorporated into the dekinking mechanism. A single, 125-hp motor drives all of the equipment, and a chain drive connects to the cradle’s nest rollers to power the cluster-gear-driven straightening rolls, along with the feed rolls. The one drive motor ultimately synchronizes the entire system—there’s no need for material payout loops, which helps to minimize system length. The cradle-straightener can handle 30,000-lb. coils, 10 to 36 in. wide, to 72-in. OD. Maximum stock thickness is 3⁄8 in. for 80,000-psi steel. At a 12-in. feed length and 240-deg. press-feed cycle, the unit can support press speeds to 25 strokes/min. memory for storing job-setup parameter. The straightener incorporates nine 5.5-in.-dia. hardened and ground rolls, mounted using anti-friction bearings. The servo-controlled feed rolls are 8-in. dia. and hardened, ground and with a matte-chrome finish for prolonged life. The drive motor is a variable-speed AC vector-type system that allows smooth transitions in feed lengths from 0 to 99.999 in. in 0.001-in. increments. A remote forward-reverse jog pendant aides in threading new coils during changeovers. With four suppliers left in the hunt, Nieberding and his team visited existing, comparable system installations, and from these reviews they cut the prospect list to two suppliers. Stamco management made the final decision, along with an engineering and production panel, based on accumulated criteria presented by Nieberding’s team. The winner: a combination cradle-straightener-feeder from Dallas Industries, Troy, MI, installed at Stamco early in 2008. “Factors that led to the decision included serviceability features we requested be included in the design, based on our previous experiences. These features include easy access to components, including guarded-drive linkages outside the main framework, as well as cartridge-style roller-bearing inserts that simplify bearing replacement,” Nieberding notes. “Now, a bearing changeover, even a roller changeout, takes only a day or less, not the week of downtime we used to experience. The cradle’s powered side guides and integral antifriction roller bearings allow Stamco technicians to adjust the guides by as much as 2 in. in either side-to-side direction. This action permits compensation for most conditions of coil camber and helps align the material to the centerlines of the straightener and feed units. 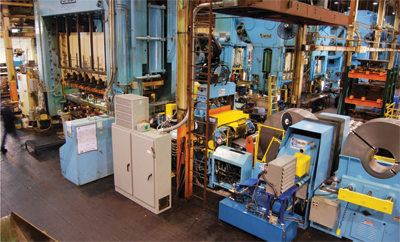 Previously, Stamco could not thread coils received with excessive camber into the existing feed line, and therefore the firm had to reject as much as five percent of incoming coils, creating downtime as stock needed to be rewound, rebanded and a fork truck sent in to remove the coil from the cradle. The new unit also features an automatic pilot-pin release mode, allowing precision die-actuated positioning of stock. The release operation raises the entire bank of straightening rolls and pinch rolls plus feed rolls, removing tension on the stock so that the material is free to move via location pins in the tooling. Then, too, the straightener head is returned into its normal operating position after the release cycle utilizing as much as 1500 lb. of hydraulic pressure to assure repeatable, accurate straightening performance. The release operation also aides in initial threading procedures of a new coil’s leading edge. “That said, we’ve been able to run some jobs without the use of the die locating pins,” Nieberding adds, since the feed line provides the feed-length accuracy required for the job. Now that its feeder is more reliable, it’s no longer the bottleneck for the press line. In fact, Stamco expects to be able to increase the press’ stroke rate by as much as 10 percent, confident that the feeder will keep up. Information provided by Dallas Industries, Inc., Troy, MI: 248/583-9400; www.dallasindustries.com.